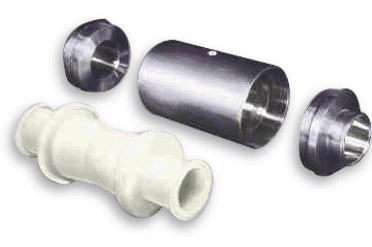 The 26F Sanitary Valve’s unique one-piece sleeve design, with Tri-Clover Tri-Clamps®, incorporates an integral O-ring seal molded onto the sleeve ends. The design makes this sanitary valve a straight through port design, eliminating crevices and dead spots, in order to reduce the possibility of bacteria. The key to this valve is in the flexible food grade rubber sleeve—the valve’s only wetted part. Actuation of the valve, the pinching action, is accomplished by air or hydraulic pressure placed upon the sleeve. The valve body acts as a built-in actuator, eliminating costly pneumatic, hydraulic or electric actuators. Adding pressure within the annular space between the housing and sleeve can throttle or close the valve. Control can be accomplished with a booster or proportional relay. The sleeve’s flexibility allows the valve to close “drop-tight” around entrapped solids, eliminating “hang ups”. The valve self-cleans each time it is actuated. With the 26F Sanitary Valve there are no seats or packing to replace, or dead spots to collect food particles. When the valve is open, it is like a straight piece of pipe in the line, a significant advantage over weir style diaphragm valves.